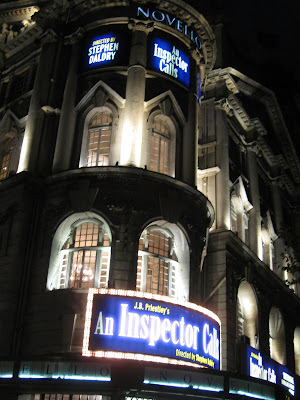 On Saturday night in London, we saw An Inspector Calls at the Novello Theatre in the West End. 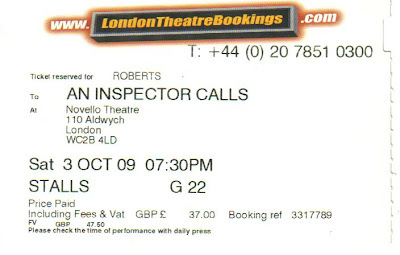 We were able to get discounted tickets at a booth in Leicester Square. I was fairly indecisive about what I would see - most of the theatre there has already been here or its coming here soon. I would have loved to see something at the Royal Shakespeare Company, National Theatre, the Donmar or Royal Opera, but pickings were slim to none. 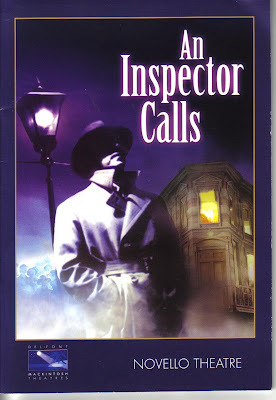 I finally settled on An Inspector Calls because it had success in New York years ago and I thought it seemed sort of Agatha Christie-like. Stephen Daldry directed that production as well as this revival at the Novello (he won the Tony for Best Direction). Plus, Nicholas Woodeson (Lord Burleigh of Mary Stuart!) is the star of this production. Our seats were terrific in the beautiful Novello. I loved the sets too. But oh, I should have done a little more homework. It was a preachy consequences and moral of the story sort of play - ugh - and the acting was just hammy. The mystery wasn't much of a mystery at all - just presentational what ifs. Unfortunately, Nicholas Woodeson was out (damn you, Lord Burleigh! ).